2016 Christmas holiday celebration is coming. Now people could do far more than giving Christmas gifts, decorating Christmas trees, cooking Christmas turkey, etc. People now could do Christmas holiday shopping with big savings, as there’re so many special offers online and in local malls. Also, watching Christmas Blu-ray/DVD movies has become another popular method to celebrate Christmas. People get more for Christmas holiday celebrating. The atmosphere of Christmas has been flooding the air. 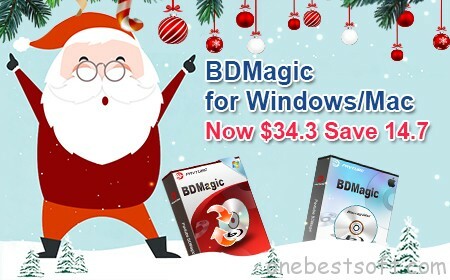 Becoming a leading and professional multimedia software developer and provider, Pavtube Software prepares big Christmas gifts to worldwide Blu-ray/DVD movie fans and music lovers by launching Christmas Giveaway & Deals activity. The mega discount starting today will expire on Feb 6, 2017, along with Pavtube Year-End Deal online promotion to win the low-price deals – Pavtube BDMagic / Pavtube BDMagic for Mac for both Windows or Mac users. What Does This Pavtube BDMagic can do for you? Want to Get This World No.1 Powerful Blu-ray Ripper? Everyone Has the Chance to Get the Special!